I haven’t talked much about this book because busy. But I absolutely love this cover. 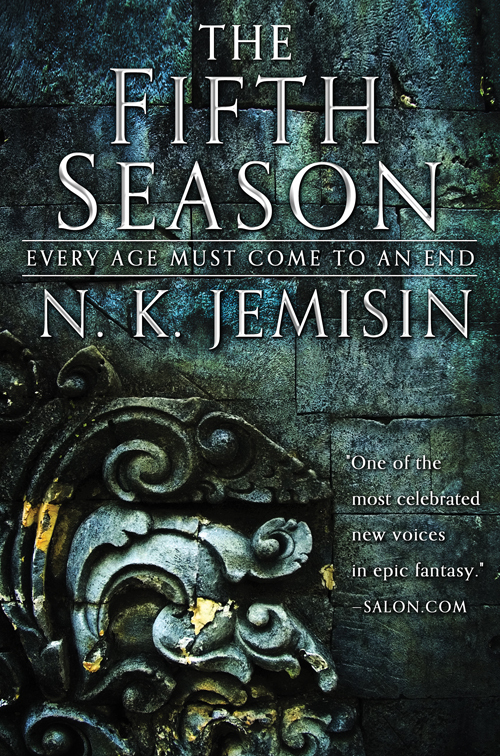 The Fifth Season is set in a world which has suffered frequent, repeated Extinction Level Events for millions of years, and all life (and magic) in this world has adapted to it. Hundreds of years might pass between these events — easy, plentiful years in which great cities rise, and people have the leisure for art and science and rapid advancement — but then, again and again, the cities fall. The world is littered with the detritus of these times of plenty, and this cover hints at them: past ages of decadence, now decaying; stone that endures beneath flaking gilt. Lauren Panepinto (Orbit’s Art Director) has nailed it again. Oh, *hell* yeah. That is a gorgeous cover. I would throw my money at the computer screen, but I know it won’t help me get this book any faster. Can’t wait for its release! So looking forward to this! Also, love the tag line. So if The Fifth Season is the name of the book, what is the name of the series? I’ve read every of your works so far. I can’t wait to get my hands on The Fifth Season. Oh! I really like the premise. Looking forward to being able to read it!